Most people today are skin conscious. We want our skin to look young and healthy, and will usually do as much as we possibly can to protect our skin from whatever possible harm there may be in our environment. Of course, every woman wants to have a beautiful clear and radiant complexion. But are you doing as much as you possibly can to care for your skin? Skin is your largest organ, and it performs several very important functions that are vital for your survival. It’s primary role is to protect us against the invasion of foreign substances and bacteria, but it also serves as the transfer point for the release of toxins from our bodies. Therefore, your skin is far more than just your outward appearance and is truly worthy of protection and care. So if you find yourself coveting the gorgeous skin of fashion models and celebrities in most of today’s magazines, here are seven best tips that will help you achieve a beautiful clear complexion that lasts a lifetime. Always deep-cleanse your skin before applying any products. And wherever possible, avoid using commercial soap since this can be very drying and instead use a cleanser with gentle, natural ingredients. Dispense your cleanser onto the fingertips and gently rub them together to warm it slightly. Apply the lotion to the face and neck with light circular movements to dislodge and remove any impurities. Don’t rub or stretch your skin, or use excessively hot water since this can damage your skin over time. Make sure your cleanser is on your face for up to half a minute to dissolve away the dirt, and tissue or wash off according to the products instructions. To remove any final traces of cleanser and to close your pores always use a toner that does not disturb the skins delicate pH balance. Choose a gentle cleanser containing natural botanical cleansing agents rather than one with harsh chemicals. Hydrosols such as Rose, Orange Blossom, Geranium or Lavender are excellent for this job because they are totally natural and bring great skin-conditioning benefits. Soak two cotton wool pads with toner or hydrosol, and with upward and outward movements sweep across the face and neck. Daytime replenishment is absolutely essential to keep your skin soft and free from the drying effects of central heating and the sun. After completing your cleansing routine apply some hydrating cream or lotion to your finger pads, gently rub together to warm it and apply to the face and neck in upward and outward movements. Don’t forget to hydrate the eye zone, but be sure to use a very light product which is designed for this. Quinessence Aloe Vera and Lavender Gel hydrates, soothes and tones, making it perfect for this type of application. Overnight treatments are especially beneficial since as you sleep, your skin is replenished, renewed and hydrated. Warm your hydrating night cream between the finger pads and apply in upward and outward movements to the face and neck avoiding the eye area. Don’t forget the neck and décolleté area since like your hands, it can truly reveal your age! Ideally, you should apply a light hydrating gel around the eye area to complete this step. To keep your skin in tip-top condition you should exfoliate every 10 to 15 days as this is a quick and effective way of removing dead skin cells. It leaves the skin soft and radiant, enhancing the absorption of your treatments. The best time to exfoliate is in the evening before applying your night-time treatment. After finishing your cleansing routine, warm up a small amount of exfoliator on your finger tips and apply to the face and neck using light circular movements. Make sure you avoid the delicate eye area. Rinse off with warm water and either follow with a mask or finish off with your toner. Use a clay mask for facials if possible, since they are highly absorbent and naturally help to draw out impurities in the skin and unclog the pores. Seaweed helps to deep-cleanse, re-mineralise and purify the skin, so for best results look for a mask containing this deep-sea treasure. After exfoliating your skin apply an even layer of your mask to the face and neck, again avoiding the delicate eye area. Leave the mask on for 5-10 minutes and rinse off thoroughly with warm water, finishing off with your toner. Having beautiful skin is not just about what you put on your skin, there’s more to it than that – beautiful skin comes from deep within. Drinking plenty of water not only prevents your skin from becoming dehydrated, but it also supports the ability of the skin to produce sebum which is your skin’s natural oil, from the sebaceous glands. Washing and showering only cleans off the perspiration and other substances from the surface of the skin, whereas drinking lots of water dilutes and washes away toxins from within the body and at the same time hydrates the skin, helping it to look and feel much younger. Make drinking water a habit today, and your body will thank you for it by helping you to stay young looking. A woman's appearance on the outside is generally a good indication of what's going on inside her body. Poor nutrition, unhealthy lifestyle choices and stress all contribute to the overall poor health of the skin. Bad habits such as smoking and consuming high-fat, high-salt diets deprive the body of the important nutrients skin needs. Remember girls, it's never too late to improve your looks! 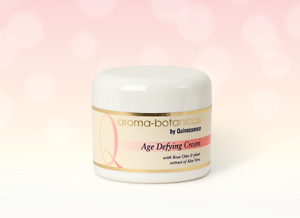 In the prestigious Natural Health and Beauty Awards 2008, Aroma-botanicals® Age Defying Cream was voted the outright winner in the 'Best Day Cream' category. When used regularly, our advanced formula combining organic English Lavender and Rose Otto oils together with Shea Butter and Aloe Vera works to slow down the ageing process and improve micro-circulation. A recent study reported in the British Medical Journal found that people who use sunscreens the most are more likely to get skin cancer than those who never use it. This is because they mistakenly believe that they can stay in the sun for longer, especially when the sun is at its hottest. Dehydrated skin is more prone to wrinkles and adds another factor to the aging process. Skin loses it's flexibility as we age, but good nutrition, water and the use of high quality, natural skin care products will help to slow down the aging process - and can even make you look younger!